When a couple went back to the drawing board to rethink the design of their vacation retreat, timber houses came to their minds. The best-laid house plans are actually not always the plans you want to go with. So it went for Nancy and Gary Pollock, who had locked down a design for a traditional three-story vacation home with log siding. 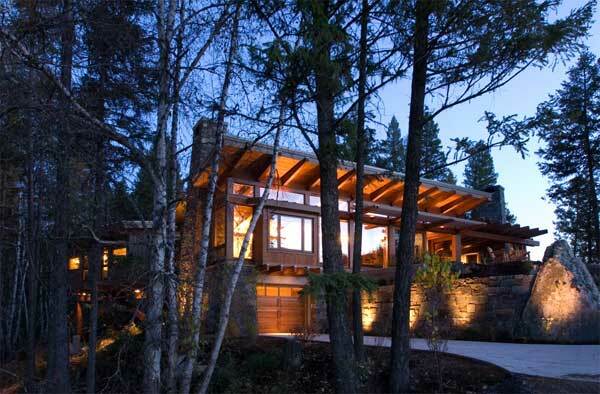 It was to be built on a beautiful piece of wooded property nestled between a lake and a creek in northwestern Montana. It was supposed to have been perfect, but the thing is, it just wasn’t. “I have a landscape-architect friend who said, ‘This house doesn’t do this site justice, take a look at timber houses’” Gary remembers. Gary’s friend suggested a friend of his own: Barry Gehl, a partner at Krannitz Gehl Architects in Seattle. The firm primarily does custom residential work with timber houses and is known for its innovative design. And so the original plan was completely scrapped and, in its place, a vision for a modernist timber home. The new timber frame house design combines some of the Krannitz Gehl’s signature touches: erasing barriers between interior and exterior living spaces and exposing the timber home’s structural elements as part of the design. But it also breaks down the traditional housing ”box” into a series of separate structures, built to look like cabins, each providing its own unique experience and focusing on a different view. Low-roofed portals or vestibules connect three of the cabins: the main house, the master bedroom and the kid’s cabin. The fourth, a guesthouse, is separate but similar in appearance. This was an important factor for Gary, an avid sportsman, who wanted to capture the feeling of an old fishing camp. “I wanted something architecturally interesting, but not ostentatious. This timber house is contemporary, but it also has a down-to-earth cabin feel,” he says. That combination may seem hard to pull off, but Barry says one reason the design succeeds is simple: “Even with its modern approach,” he says, “it’s still part of the timber houses family.” And while the structure does in fact make a bold statement, it also fits gracefully into its natural surroundings. The Pollock’s timber home couldn’t be farther from the idea they started with and yet somehow, it’s exactly what they wanted. “I love everything about timber houses,” says Gary.